Developmental biology is the study of how organisms including plants and animals, grow and develop. This includes the biology of regeneration, metamorphosis, asexual reproduction, the growth and differentiation of stem cells in the adult organism as well as the genetic control of cell growth and differentiation to form tissues, organs and whole organisms. These organisms include C. elegans, Drosophila, Arabidopsis, mice and Zebrafish. Due to the differences in object size and tissue composition, it can be hard to image the small details required to see development, along with the large picture of the entire organism, however there are microscopes available that make this possible. This is a mouse kidney that was captured under a fluorescence research microscope. The sample was prepared by Michael W. Davidson at Florida State University. 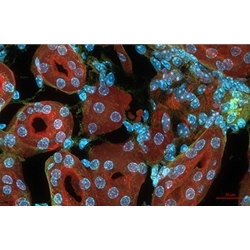 The mouse kidney section was examined with DAPI nuclei, Alexa Fluor 488 Wheat Germ Agglutinin, Alexa Fluor 568 Plahhoidin actin. It was examined with a Zeiss ApoTome.2 using the Zeiss Axiocam 702 monochrome microscopy camera. It is important in developmental biology to be able to view not only the entire organism, but also fine details. Zoom microscopes such as the Zeiss Axio Zoom.V16 (shown at left) combine both a large field of view of a stereo microscope with high resolving powers and the bright fluorescence of a compound microscope. The result is a detailed and brilliant visualization of fine structures in the entire organism of interest - the best of both worlds! The high numerical aperture results in outstanding fluorescence brightness even in large fields of view. For routine everyday tasks there are several stereo microscopes that provide 3D images allowing inspection of organisms, sorting for breeding, selecting individuals for experiments and accomplishing micro-dissection. 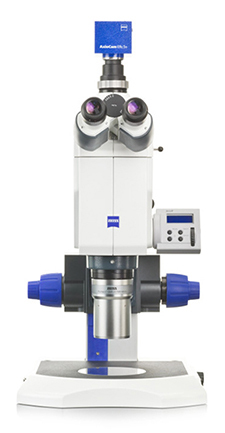 The Zeiss Stemi 508 stereo zoom microscope provides 8:1 zoom ratio and the apochromatic optics produce superior images. The Fein Optic FZ6 high resolution stereo microscope provides 6.7:1 zoom ratio with crisp and clear images at an affordable price point. Confoal laser scanning microscopes and spinning disk microscopes are powerful tools for three-dimensional and multicolor fluorescence imaging. Developmental biology strives to watch living organisms develop over time however, phototoxic effects from traditional imaging methods can challenge these attempts. Light sheet fluorescence microscopy is a new method for gentle, deep and fast 3D imaging. 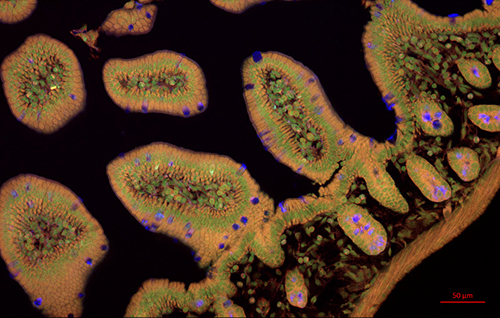 This is a mouse intestine developmental biology sample that was captured under a fluorescence research microscope. The sample was prepared by Michael W. Davidson at Florida State University. The mouse intestine section was examined with DAPI nuclei, Alexa Fluor 488 Wheat Germ Agglutinin, Alexa Fluor 568 Plahhoidin actin. It was examined with a Zeiss ApoTome.2 using the Zeiss Axiocam 702 monochrome microscopy camera. Developmental biology investigates the formation of complex multi-cellular organisms from a single egg. This can range from studying the elaborate series of cellular movements during morphogenesis, the intricate sequence of signaling events that occur during pattern formation, to the highly orchestrated system of gene expression in an embryo. At some point in each of these studies a developmental biology microscope is used for observation. Microscope World has developmental biology microscopy needs covered from the basic stereo microscope up to the advanced motorized fluorescence zoom microscope. Contact Microscope World for further information on confocal laser scanning microscopes and light sheet fluorescence microscopy. 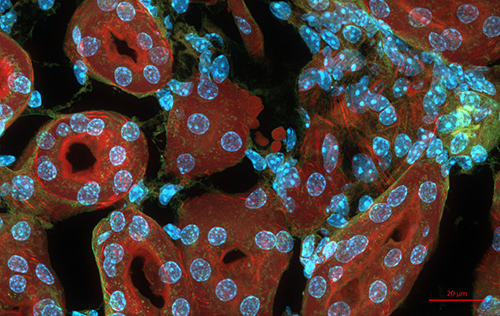 Our microscopy specialists can put you in touch with your local representative for a demo.